Sigh, it's been so long since I blogged that I reckon I have forgotten how to already. Here's my attempt in getting back into the groove and clearing that mountain of blog posts. It is not like I don't eat out almost every day but honestly, it's getting harder and harder to find really good places to eat. 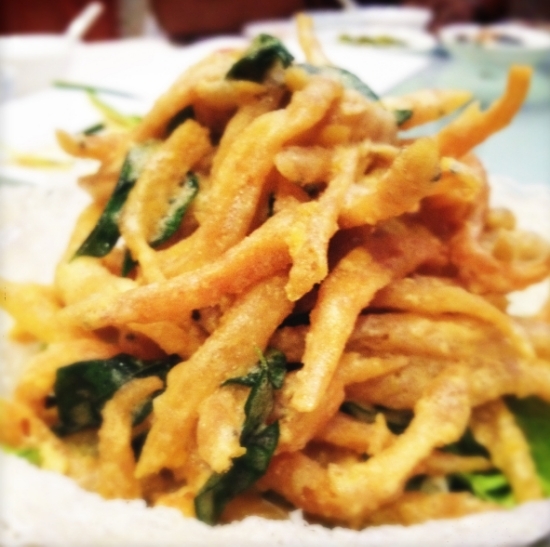 Instead, we gravitate towards old places we are familiar with such as Gu Yue Tien where dishes are always tip-top. 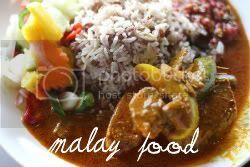 It is heartening to see Places & Foods chose this place for his choice for this year's Time Out KL's awards (vote for it with this link). Hopefully it picks an award as the food here is always innovative and darn good, every visit I've been. My friend CS had rounded us up for a dinner here. She had sampled the set dinner they had introduced to celebrate their eighth anniversary that is priced at RM880++ for 8-10 persons. Her raves got our tongues drooling hence we gathered here one rainy Saturday night. We didn't meet the quota for eight persons, hence there was an extra portion, but that was easily eaten up. The meal kicks off with an assortment of appetizers, ranging from the exciting to the ho-hum ones like deep-fried prawn dumpling and century eggs topped with a slice of pickled ginger. All of us had our own favourites. I immensely enjoyed the crispy whitebait. Each fish was deep-fried to a golden crunchy texture that was coated with the immensely umami-tasting salted egg yolk. Curry leaves and chopped chillies gave it a slight fiery hit. I reckon if I could have eaten it all up by myself. 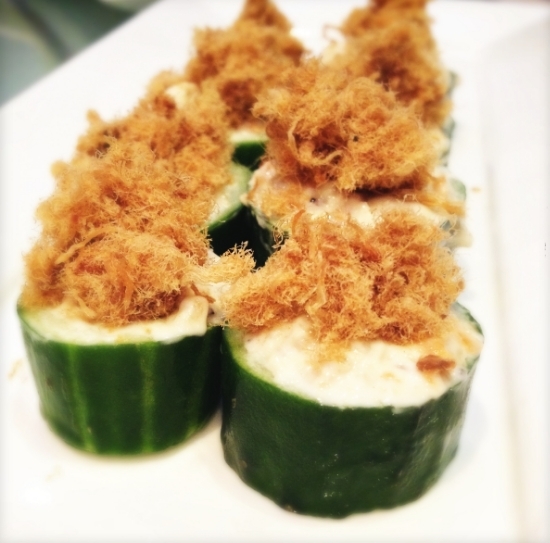 The cucumber cups with chicken floss was simple but tasty. I especially liked the crunchy texture of the Japanese cucumbers combined creamy mayonnaise with the savoury taste of the chicken floss. Kinda reminds me of those addictive floss buns I must always eat at Bread Talk. 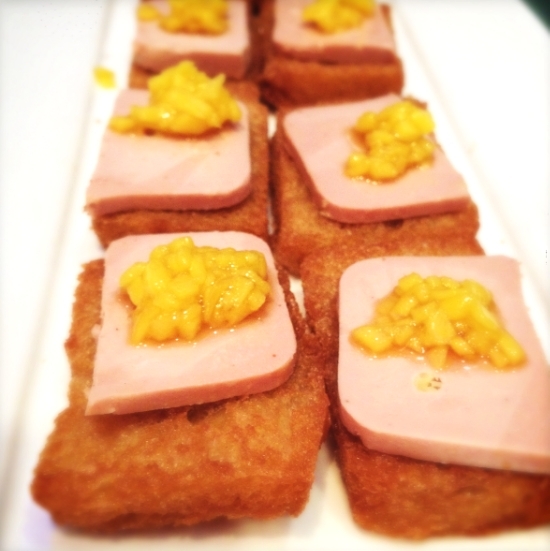 The foie gras mousse on the deep-fried toasts were yummy too and topped with a piquant diced mango pickle to balance out its richness. 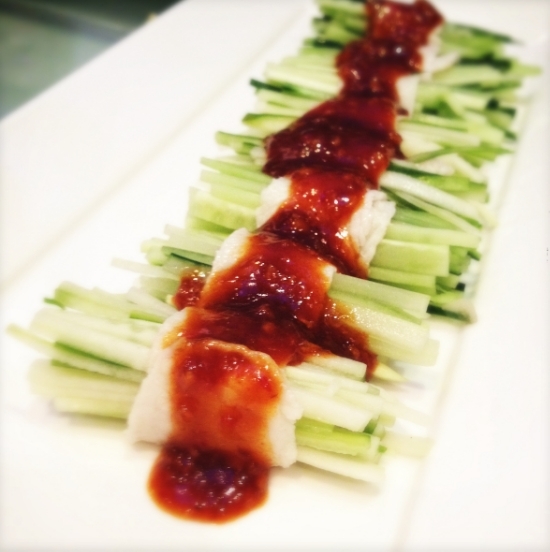 The jellyfish appetizer with the cold chicken topped with the tangy chilli sauce was an excellent way to kick up our appetites for the main meal. 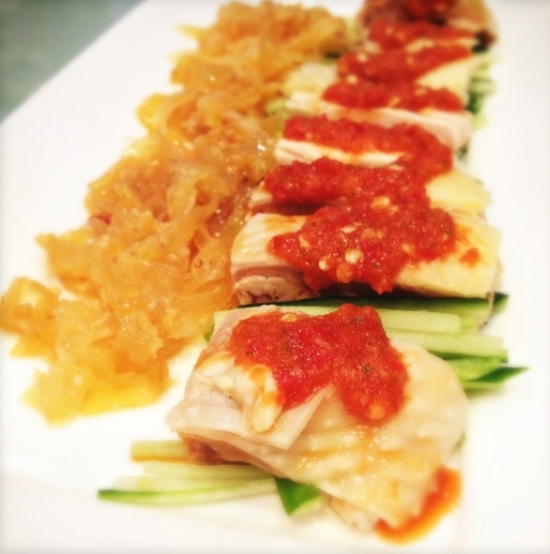 A crowd favourite was the pork neck slices wrapped around crunchy cucumber slivers. What made it yummy was the hot bean sauce that topped it. 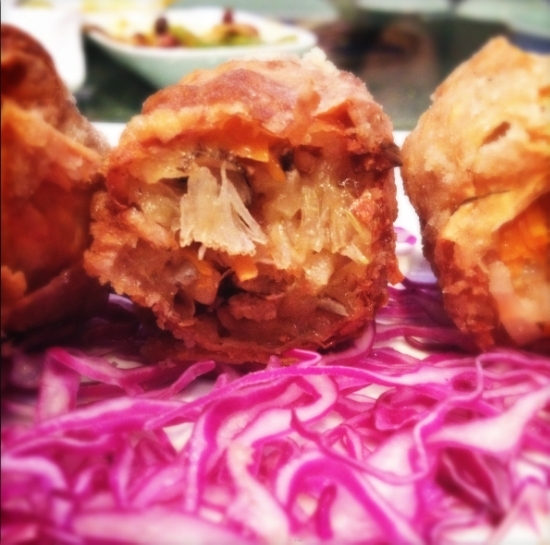 An old school appetizer was the crabmeat balls with a crunchy beancurd skin exterior. 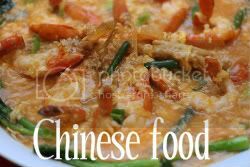 In the olden days, it would have been made from the pig's caul (fine net-like) but nowadays, it has been abandoned for the healthier beancurd skin. These delectable morsels are stuffed with fresh crabmeat, crunchy water chestnuts, celery and carrot with a light touch of five-spice powder. Since it was a rather cold rainy night, the slightly thick but aromatic soup hit the right spot. There were chopped up seafood and tofu cubes as we dug into our bowls. I really enjoyed the next dish, the prawn that came with this slurpworthy sauce. It was piquant and slightly spicy, with a thick texture. 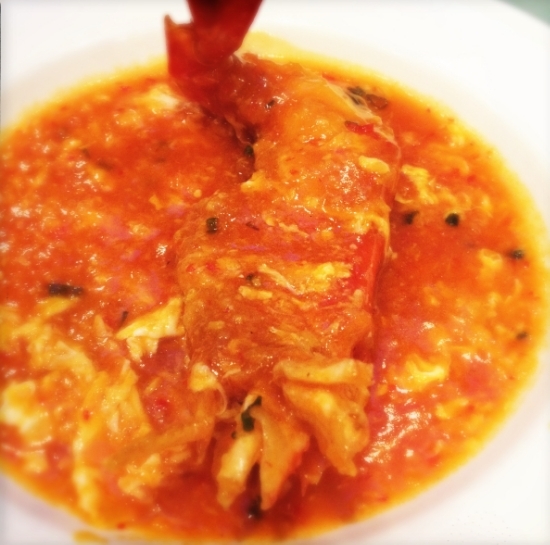 One could imagine a crab being cooked in this sauce that would have us licking all our fingers. This came with toast for us to dip and sweep up the sauce as daintily as possible. 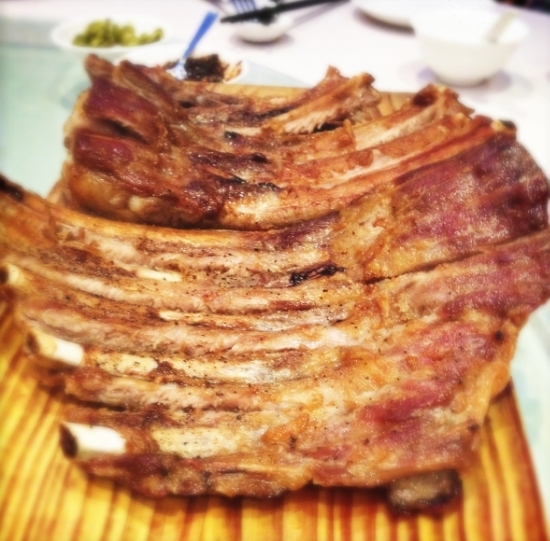 The meat item was a choice between, the wok charred lamb rack or iberico pork ribs. I've always loved those ribs and it was delicious and so good that one did not mind messing up our fingers as we ate each long rib with our fingers. 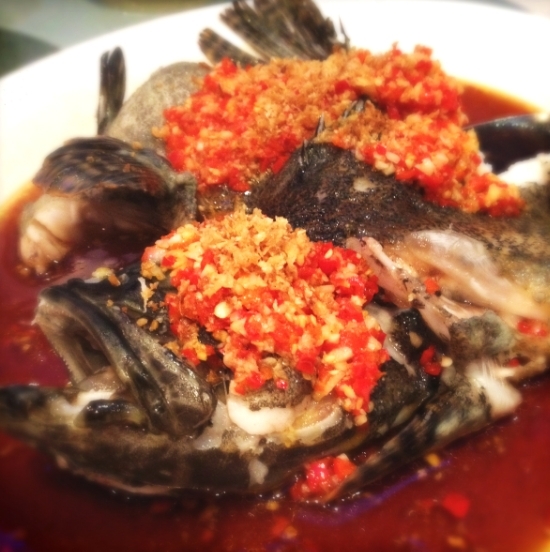 Then came the steamed fish topped with a generous sprinkle of chopped chillies and garlic, cooked Hunan style. This was yummy as the smooth fish flesh goes well with the tangy (but strangely enough not spicy) chilli and garlic mix. It is served with blanched beehoon noodles, that soaks up the soy sauce, garlic and chilli topping so well. 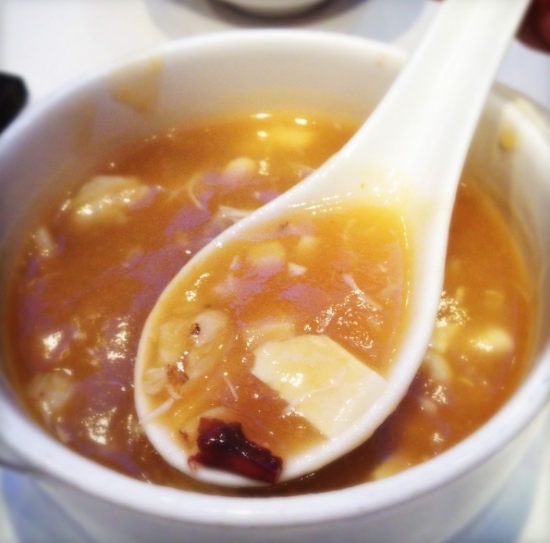 Last but not least, we end with a refreshing dessert of chilled sea coconut with longan and snow fungus. There's a slice of lime underneath the glass that adds a tangy taste to the not overly sweet dessert. Thumbs up to my friend CS for the great recommendation and Frankie Woo of Gu Yue Tien for not dissapointing our fussy palates. I didn't even know this place existed. Thanks for the tips. Nice to see you back! it is hard to find good food, isn't it? This looks fantastic! chef frankie always know how to woo his customers. one of my fav places too. Gu Yue Tien is a really great Chinese restaurant. I love the Iberico ribs! their food is just incredible! sorry i missed it.. sigh..
That feast looks to be well worth the price. And effort of bracing oneself through the traffic to KL? Still can't gather a group big enough for a meal there, yet won't be too far off I suppose. Clever mix of flavours from what I see. I never heard of Gu Yue Tian before.. heheh! *Still young (and naive)* Just kidding.. The food here looks delicious and there seems to be some innovative dishes like the foie gras on toast too. My parents likes Noble House behind Jalan Imbi whenever we are in KL and the food there is pretty good too. 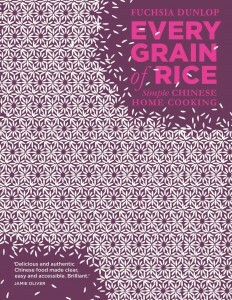 This is such a great resource that you are providing and you give it away for free. I love seeing websites that understand the value of providing a quality information about Melbourne Restaurants . Thanks for sharing.